Teaching kids is one of the most delicate and challenging jobs as there is no fool-proof way on how to teach kids. To instill the right amount of knowledge and skill without making them lose interest in studies is a hard task and can get very difficult at times. But there are various methods and techniques that can be used to make a child learn faster. Spatial or Visual Learners are taught through pictures, icons, charts, diagrams, and color coded information. On teaching any academic subject, kids must research topics using graphics and compile their findings into a poster. Visual learners can also retain more information as they use different colored pens, pencils, markers, labels, and sticky notes, which help them, remember in a better way. Auditory or Aural Learners thrive on teaching techniques that involve sound. Making up a story or a song or a rhyme with the directions of the main concepts of the lesson helps children to learn much faster. For younger children, oral storytelling and sing-along, making up poems or songs help them to teach important lessons. Linguistic or Verbal Learners use words and texts to memorize concepts. Copying down phrases and words, taking their own notes during lectures, reading out loud, listening to audio recordings, and discussions are effective teaching methods and techniques for this type of learners. Spellings are taught by having them write out the word correctly, multiple number of times. Writing helps the brain to retain information ten times more, than just reading or visualizing. Physical or kinesthetic Learners learn through creating. Kids learn better if they are encouraged to create and built their own imagination and experience, no matter what they are learning. Sports, Technology, Trips, Games are also effective teaching methods for physical learners. Children must be motivated to learn from their mistakes and failed attempts and rectify it in their next approach. Logical or Mathematical Learners use problem solving as a way to learn new materials. They excel at following complicated directions and using technology and games to reach learning outcomes. They can be taught in a more efficient way about technology and must be given special attention. Logical Learners often go for Engineering, Mathematics or in some Research Fields as these professional fields typically follow logical rules. 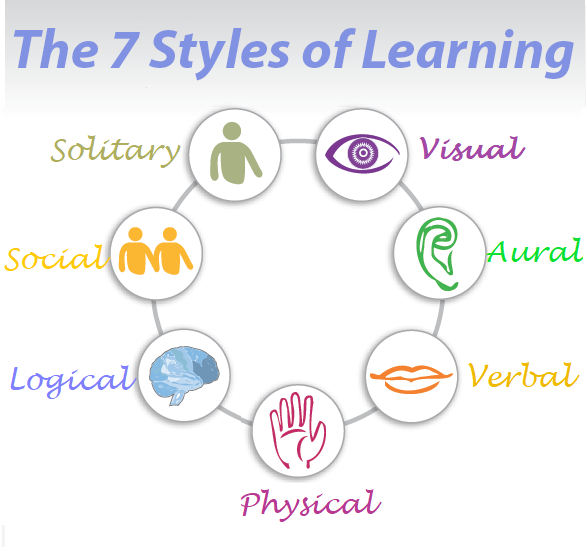 Social or Interpersonal Learners thrive on interpersonal communications and learn best in a group atmosphere. These types of learners can be taught by Group Discussions, Sports, Social Activities, Discussions and by all other activities where group of person participate. Solitary or Intrapersonal Learners are self-paced learners. They rely on online communities and enjoy watching how-to-videos and reading to learn new things. They should not be pushed or forced to do stuff, instead they should be allowed to work and learn at their own pace. It is not at all necessary that only one of the seven teaching styles be used, these methods must be blended and used to educate a child and expand their knowledge in a much simpler way and in a lesser time. A number of different teaching techniques have emerged due to change in education over the years. Many of these teaching techniques are not actually new; rather they have been modified for better and faster learning. Thus, new facilities and modern equipments are encouraged along with traditional old methods to bring out an effective way, for better understanding for the kids.